Citation: Gion, A.M., Williams, S.E. and Müeller, R.D., 2017. A reconstruction of the Eurekan Orogeny incorporating deformation constraints. Tectonics, 36(2), pp.304-320. 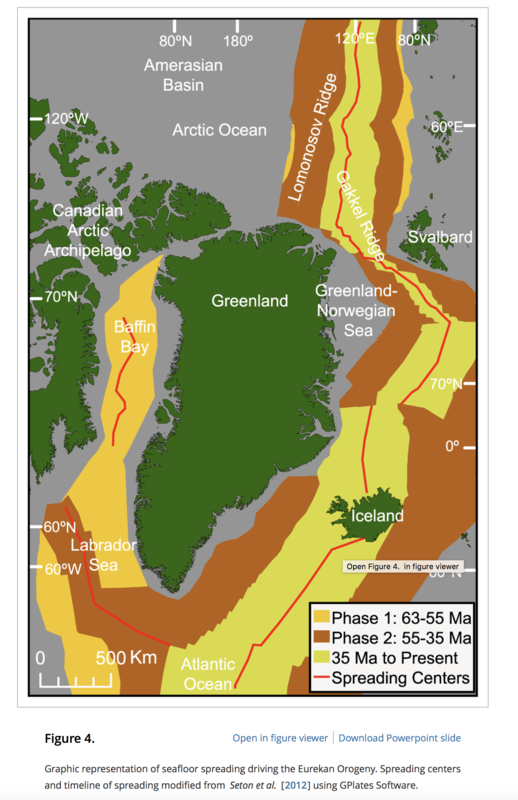 The Eurekan Orogeny records Paleogene convergence between Greenland and the Canadian Arctic. The complexity of the region, well represented by the disputed magnitude of Cenozoic sinistral displacement of Greenland relative to Ellesmere Island, stems from the simultaneous evolution of multiple tectonic regimes, as well as overprinting of later tectonic activity. Presented here is a plate model of regional crustal deformation constructed with the interactive GPlates software that enables an evaluation of previous reconstructions of the Eurekan Orogeny. This model is built upon a synthesis of published geological and geophysical data and their interpretations. It incorporates two phases of deformation from ~63-35 Ma. Phase one, ~63 to ~55 Ma, involves ~85 km of Paleocene extension between Ellesmere and Devon Island, extension of ~20 km between Axel Heiberg and Ellesmere Island, and ~85 km of sinistral strike-slip along the Nares Strait/Judge Daly Fault System, matching a range of 50-100 km indicated by the offset of marker beds, facies contacts, and platform margins between the conjugate Greenland and Ellesmere Island margins. Phase two, ~55 to 35 Ma, results in total east-west compression of ~30 km and ~200 km of north-south compression across Ellesmere Island. This model confirms, for the first time, that key observations from sub-regions deformed by the Eurekan Orogeny are compatible on a broad scale. We have also identified potential problem areas in southwestern Ellesmere Island that are less compatible with a best-fit model, given current constraints. This deforming plate model offers a platform and base model for future research.